On Saturday, I looked in to all the hives to see how the splits and packages were doing. I pulled out the queen cages earlier in the week from the package hives, but now I needed to see if the queens were alive and laying. When I pulled out the queen cage earlier in the week, I realized that I really had no clue about how to inspect a Langstroth hive. When you take off the cover, the bees are just right there whereas in a Top Bar Hive, you slowly expose them as you inspect the frames. So, I read up a little on it and watched some YouTube videos and by Saturday, had a better idea of what to do. They were only going through 2 quarts/week of sugar water, so they had plenty to eat. Plus, they were bringing in pollen. However, I didn’t see any eggs or larva and couldn’t find the queen so I’m not sure the queen is still in there/alive. Reading through “The Beekeepers Handbook“, Diana Sammataro says you should leave the hive alone for 14 days after checking that the queen was released, which seems like an awfully long time to check whether she was alive and laying. By my math, worker bees live 6 weeks and it takes 21 days (3 weeks) for new workers to hatch, so it would seem that you would need to have a laying queen within 1-2 weeks for enough new workers to replace the ones that came in the package. I’ll check again next weekend if I can – the weather is supposed to be rainy for a while. The next stop was Sarah’s top bar hive to see how that package was doing. When I started looking in, I realized how much I like top bar hives better than Langstroths at this point. You expose the frames one by one, so to me it seems a bit calmer (at least I was). 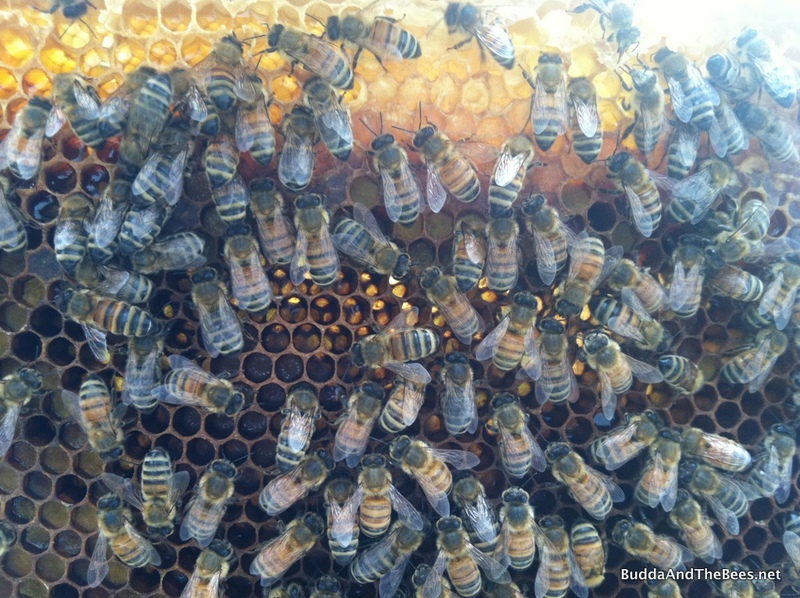 When I took out the queen cage earlier, the bees had already started building new comb. They had built out the small combs even more and I found some larvae and the queen. So, this hive was doing well. 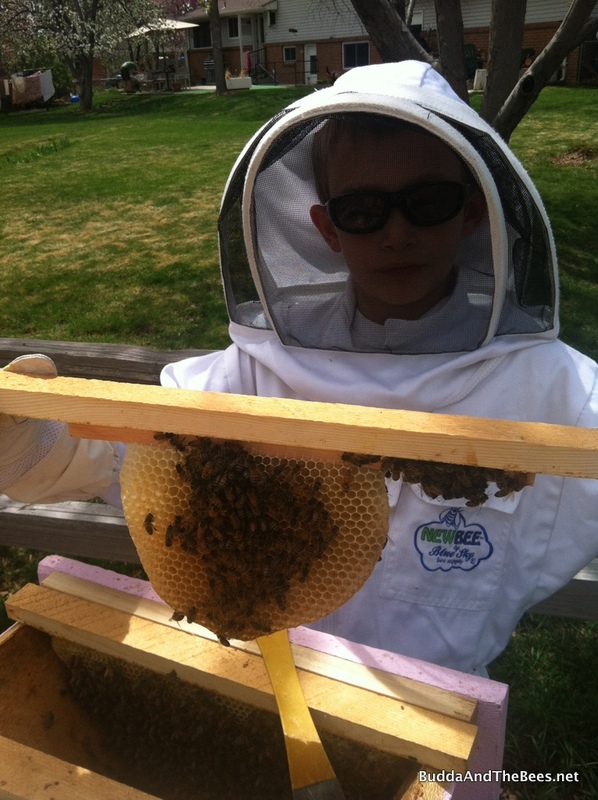 When I got home, I got Duncan and we suited up and checked on the remaining hives. The Hello Kitty bees had also built some comb around the queen cage and looking in this time, we found some larvae and more built out comb. We didn’t find the queen (the last one in this hive was also elusive), but the signs were there that she was alive and well. Next, it was time to check on the splits in my backyard. Just looking at the entrances, there were a few bees going in and out in BnB1 (the hive that got the split) and BnB2 was just bubbling with bees as before. We found the queen in BnB1 and there was some new capped brood and larva. I had hoped for more, but this queen doesn’t seem to lay prolifically, but she does lay steadily – enough to build up the population pretty well. When we looked in BnB2, it didn’t look like any of the queens had hatched from their cells, but there were a couple of queen cells that had been destroyed (so maybe one had). There were two distinct sections in the hive – up front near the entrance which had lots of nectar, pollen and a bar of queen cells, then a section with more nectar, pollen and still a lot of drone brood, plus 2 bars with queen cells on them. One of my bee mentors had said that you should only allow 4-5 queen cells when doing a split because if there are more, there’s a good chance for a swarm to happen. I had a few more than that, but thought that I would be okay. Sure enough, yesterday BnB2 threw a swarm, so another lesson was learned. I probably should have done another split last week, but the weather just wasn’t cooperating. So, except for the Left Hand Hive, they all seem to be doing well. 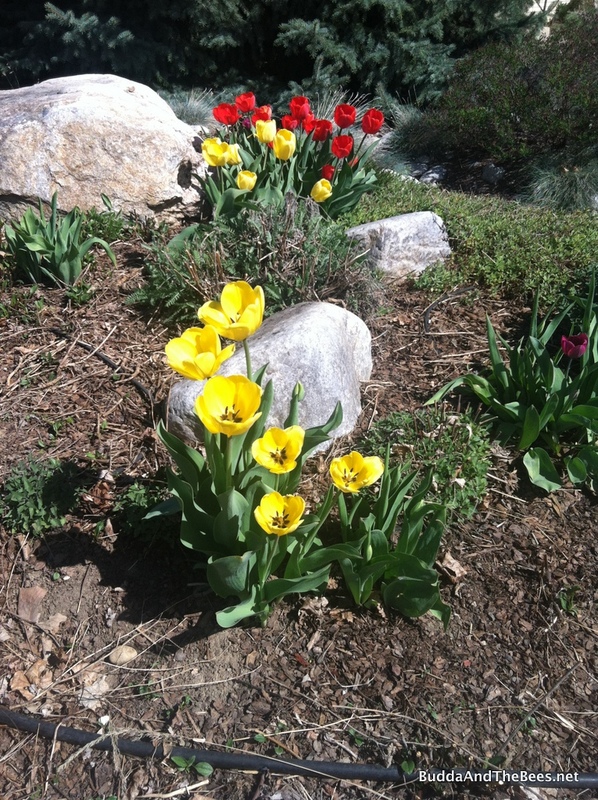 We’re in for a week of rain which will keep the bees cooped up, but for now, the tulips and fruit trees are blooming and there’s plenty of food to be had. Glad to hear that all of your hives are doing well. You must be getting quite busy with so many hives spread across locations. I keep thinking about looking for outyards, but then I stop for the same reason I won’t get a community garden plot. It’s easy enough for me to keep up with things when they’re in my own backyard, but I’m not sure how well I’d do at finding time to inspect if I had to drive all over town. BTW, I never noticed the embroidery on Duncan’s suit before, but I love it! Having the hives spread out is more of a pain, but I can hit them in succession on my way home from work pretty easily. I just have to be a little more organized (already I keep forgetting to bring my sugar water with me to work!) Other people are asking for me to help them, but I want to see how well I can do the 5 (or now 6) that I have this year. An empire has to start somewhere! Poor Duncan was really sweating in his suit on Saturday when the temps were close to 80! I’ll tell him you like his suit! You are quite a popular guy! Sounds like you could set up a mentoring or Beek for Hire service. Chris Harp of HoneyBeeLives does that. I dream about that at times myself! 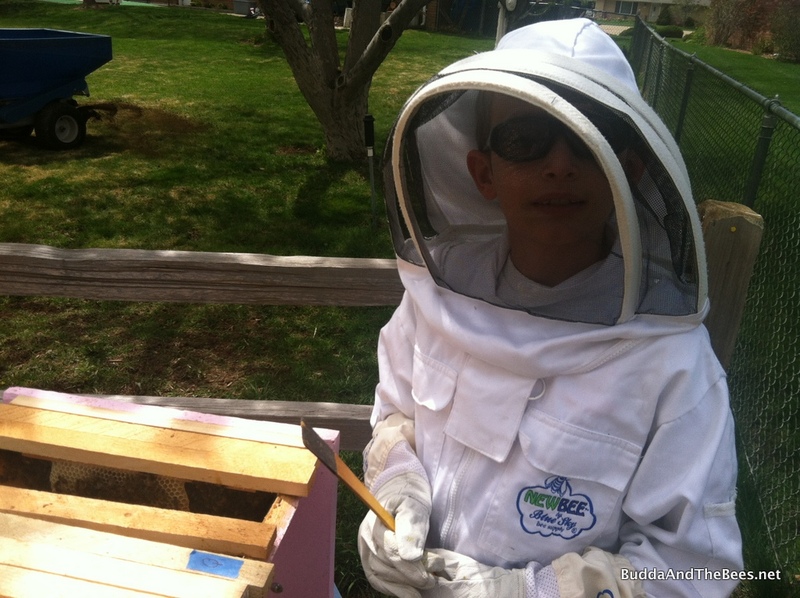 Being paid to take care of bees — talk about living the life!